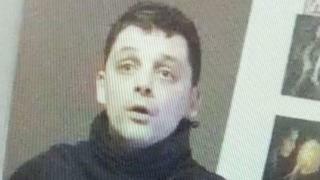 An escaped prisoner has been seen wielding a knife in Wiltshire. Jason Sufi is serving a nine-year sentence for burglary, false imprisonment and robbery, but fled HMP Springhill, last month. Wiltshire Police said Sufi was last seen on Thursday in the Archers Gate area of Amesbury, following his escape from the Buckinghamshire jail. A spokesman said he dropped the knife as he ran off. Police urge anyone who sees Sufi to call 999. "At no point were any officers or members of the public threatened with the knife," the spokesman said. "Anyone who sees a man matching this description [should] not to approach him," he added. Sufi, 39, is described as white, about 5ft 6ins tall, with olive skin, dark hair and with a medium build. He was wearing a long-sleeved black top, black shorts and white socks and trainers.